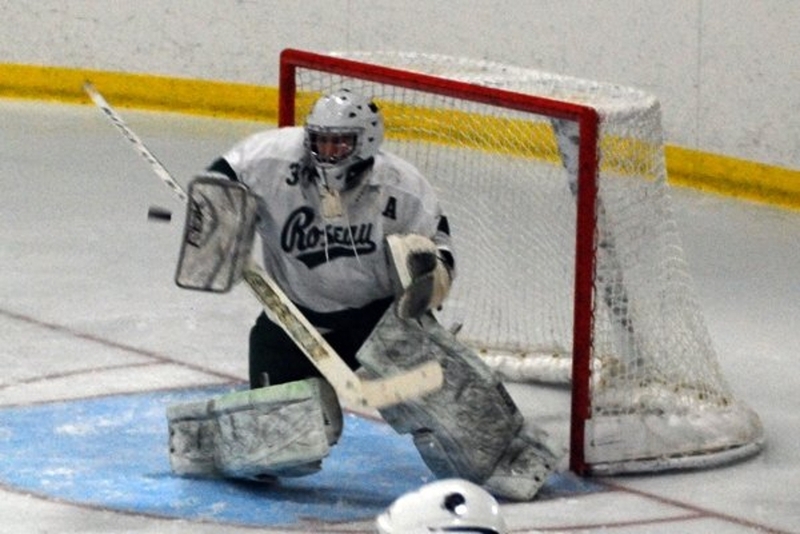 ROSEAU — Throw away the wins and losses, the goals tallied and the state rankings. When the Faribault High School boys hockey team traveled to Roseau for the Rams’ holiday tournament, the Falcons understood at the bare minimum they’d be competing against some of the purest, finest hockey teams in the state. In the process, they’d be bonding as a team in a way that might help them attain similar excellence. The Falcons (8-4) did just that, taking third at the tournament after going 1-2 on the week. After Faribault’s 6-2 loss to Alexandria on Tuesday, the Falcons fell 8-3 to Roseau on Wednesday before defeating Lake of the Woods, 6-1, on Thursday. Ryan said the weekend was appealing because while playing some of the top teams in the state — Alexandria is ranked No. 9 in Class A, while Roseau is No. 12 in Class AA. In the process, FHS, Class A’s 11th-ranked team, learned about itself and what it’s capable of. Ryan said several members of the team, such as Jimmy Kittleson and Nick Murray, had strong weekends and stepped up in key situations. He said playing state-ranked teams now will benefit Faribault as the team moves through postseason play. The Falcons return to Big 9 Conference play Thursday with a home game against Austin before traveling to Owatonna on Saturday. It will be the first chance FHS will get to show off how it might have grown as a team in Roseau. Scoring — First period: 9:08 ROS Adam Knochemus (Shane Omdahl, T.J. Erickson), 12:16 FHS Bo Putrah (unassisted) SHG, 12:42 ROS Josh Erickson (Tim Tesarek), 16:21 ROS Shane Omdahl (A. Knochemus, Cole Kostrzewski). Second period — 3:08 ROS C. Kostrzewski (A. Knochemus, S. Omdahl), 13:03 FHS George Richie (Colbey Hullett, Aaron Forgaard), 14:51 ROS J. Erickson (Trevor Baumgartner). Third period — 2:15 FHS G. Richie (Ryan Dwyer, B. Putrah) PPG, 6:26 ROS T. Baumgartner (Justin Anderson, J. Erickson), 13:06 ROS Cole Kostrzewski (Mike Johnson, Travis Connell). Shots on goal — FHS 23 ROS 49. Power play — FHS 2-3 ROS 2-6. Saves — FHS Aaron Forgaard 41 ROS Ethan Kvidt 20. Scoring — First period: 2:04 FHS Ryan Dwyer (Garrett Gulsvig), 11:42 FHS Nick Murray (unassisted). Second period: 10:44 LW Travis Tom (Travis Mollberg, Kyle Poolman) PPG, 16:10 FHS Sean Lipinski (N. Murray). Third period: 0:15 FHS Dan Mahoney (George Richie) PPG, 2:21 FHS Sean Lipinski (Bo Putrah) SHG, 9:18 FHS Bo Putrah (Colbey Hullett). Shots on goal — FHS 45 LW 21. Power play — FHS 2-8 LW 1-5. Saves — FHS Wyatt Andreas 20 LW Alex Lyon 39.